A parliamentary report of 1777 recorded parish workhouses in operation at Bodmin for up to 70 inmates, and at Blisland for 4 inmates. On visiting the workhouse at Bodmin, in Cornwall, which I found in a very dirty state, I was shown down stairs into a room where a poor lunatic was confined. He lay stretched on a little short and dirty straw, with a few rags on him. His fixed, intent eyes, his shaggy hair, long beard, dirty and livid face gave him the appearance of a monster rather than a man. He took no notice, either on opening the door, or during the time I was in his room, till I came close up to him; he then took his eyes off his book, and looked at me with a more forcible appeal to humanity than I had ever felt. The floor of this room was earth, and literally a puddle of water and dirt more than one inch deep. It was with difficulty I could step into it without treading in his excrement, which laid every where about on the floor; and, from the appearance of what was in the fire-place, must have been there a fortnight or more. The keeper had most unmercifully beat the poor fellow, and given him two black eyes. I endeavoured to investigate the matter, but the mistress kept such an incessant clack that I could not put in a word edgewise. Cornwall: Blisland, Bodmin — Parish, Bodmin — Borough (4), Cardingham (2), Endellion (2), Egloshayle (2), Helland, St Kew (2), Lanhydrock, Lanhivet (2), Lanlivery (3), Lostwithiel (2), Luxulion (2), Saint Minver Highlands (2), Saint Minver Lowlands, Saint Mabyn (2), Temple, Saint Tudy, Warleggon, Withiel, Saint Winnow (2). The population falling within the Union at the 1831 census had been 18,836 with parishes ranging in size from Temple (population 29) to Bodmin Borough (3,375). The average annual poor-rate expenditure for the period 1834-36 had been £6,660 or 7s.1d. per head of the population. At the south was a two-storey front block. Bodmin front block from the south-west, 2001. To the rear was an H-shaped main block, of two-storeys for the most part, but with an octagonal three-storey hub. Bodmin from the south-east, 2001. A further block to the north included an infirmary accompanied by various outbuildings. A small isolation hospital was erected to the north-west. The Bodmin Boards of Guardians appear to have made use of the Lostwithiel House of Mercy for at least some of its orphan children. The minute books of the Guardians' meeting for 10th May, 1879, note that 'Emily Pedlar, aged 4, to be sent to the House of Mercy at Lostwithiel and be allowed £1 for clothes and 2/- a week for maintenance'. The decision clearly raised an eyebrow with the central poor law authority — two weeks later, at their meeting on 24th May, the Guardians agreed, in relation to E. Pedlar, that the Clerk was to reply to the Local Government letter and 'state that the House of Mercy at Lostwithiel is not a hospital for treatment of cripples but that the object of sending her there is to have her cared for'. Whatever the objection had been, it now seems to have been resolved. The minutes of the Board meeting on June 21st note that following a letter 'from the Local Government Board, E. Pedlar should be sent to House of Mercy without delay'. In 1882, the House of Mercy was formally accredited as a Certified School allowing it to receive, as a matter of course, children boarded out by Boards of Guardians. In September 1895, soon after the workhouse had been connected to the mains water supply, members of the town fire brigade gave the board of guardians a demonstration of how any fire could now be dealt with. A discussion followed concerning a letter from the Local Government Board, asking whether provision for inmates escaping in the case of fire had been made in accordance with a recent inspection report. The Board resolved to reply that certain internal rearrangements, coupled with the new water supply, made any further provision unnecessary. A resolution to purchase a 'jumping sheet' was lost by a large majority. After 1930, the workhouse was taken over by the Cornwall County Council and became a Public Assistance Institution known as Berry Tower House. By the 1960s, the front block had become a works and the main building a depository. The surviving former workhouse buildings have been converted into residential accommodation. The former isolation hospital is now a private house. 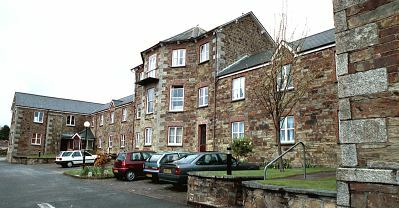 In 1913, the Bodmin Union spent £550 on the erection of a home for 12 destitute girls at 17 Beacon Road (number 22 now occupies the site following renumbering). Another house, for 14 destitute boys, was taken on Berrycombe Hill. Bodmin was also the home of the Cornwall County Lunatic Asylum, later St Lawrence's Hospital. Cornwall County Lunatic Asylum, Bodmin. Cornwall Record Office, Old County Hall, Truro, Cornwall, TR1 3AY. Relatively few records survive — holdings include Guardians' minute books (1842-4, 1877-81, 1884-7, 1896-1930); etc. Lysons, Samuel (1814) Magna Britannica, volume 3.